(Bloomberg) -- Investor unrest is increasing after Bayer AG sweetened Chief Executive Officer Werner Baumann’s bonus even as court battles over Monsanto’s Roundup weedkiller have destroyed billions in the company’s market value. Shareholder and corporate governance expert Christian Strenger, a former CEO of DWS Investment, filed a motion on Thursday proposing that members of the supervisory board not be discharged of responsibility for their actions last year. Backing from fellow investors would amount to a vote of no confidence for the board, which approved a 28 percent increase in Baumann’s bonus and has stood behind him even as Roundup lawsuits piled up. Pressure is rising on Baumann, who will face Bayer investors April 26 at the company’s annual meeting. The legal fight over whether Roundup causes cancer has wiped nearly 35 billion euros ($40 billion) off Bayer’s market value since it acquired Monsanto last June. 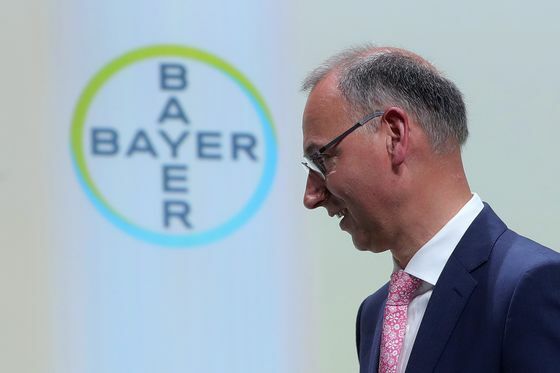 The CEO is facing challenges outside the courtroom too, as he seeks to slice away about a 10th of Bayer’s global workforce and reshape the business after his agrochemicals megadeal. “A little more empathy could be helpful to soften the impact on shareholders,” Strenger said of Baumann, who has repeatedly defended the deal. Strenger’s motion calls on the board to to ensure “only truly positive performances” of top managers are rewarded with added compensation. A Bayer spokesman declined to comment on Strenger’s motion on Friday. The company has defended the pay decisions, saying that its operating performance was good last year. Some investors disagreed. David Einhorn’s Greenlight Capital sold its Bayer shares in the first quarter after two and a half years, saying in a shareholder letter on Friday that it felt lucky to to escape without a loss. “Essentially, this investment failed at nearly every turn,” Greenlight wrote, citing disappointment in Bayer’s pharma pipeline and consumer brands and the high level of divestitures needed to complete the Monsanto deal, among other issues. Bayer boosted Baumann’s cash bonus to 1.7 million euros, for 2018. Because of a decline in the value of stock-based cash compensation, his aggregate pay dropped 17 percent to 5.3 million euros.